With basic tripod head designs, you have to screw a knurled nut through the camera mounting plate and into the tripod bush on the bottom of the camera. It’s perfectly secure, but it’s time-consuming. If you want to take the camera off the tripod for a few handheld shots, or to quickly pack up and move to a new location, having to unscrew the camera and then screw it back on again later is a bit of a chore. That’s why almost all tripod heads now use so-called ‘quick release’ plates. These plates screw into the base of the camera in the normal way and then attach to the tripod via quick-action locking mechanisms. This means that you only have to go through the relatively slow process of attaching the camera once, and after that you can clip it to the tripod head and remove it much more quickly. 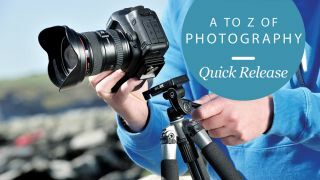 You can leave the quick release plate on the camera all the time, regardless of whether you’re shooting handheld or on a tripod, and just remove it at the end of the day. Not all quick release plates are the same, unfortunately. At one time, practically every tripod maker used a different system, but there has been a degree of standardisation since then, thankfully. The most popular and hence desirable type today is the Arca Swiss compatible type, often abbreviated to ‘Arca Swiss’. This uses a flat, rectangular plate which is attached to the camera using a coin-slot screw or, more usefully, a butterfly nut. The plate is clamped into position between two angled jaws using a locknut at the side. It’s a simple system to use and to understand, and on some designs offers a degree of horizontal movement, which can be useful for camera positioning. An Arca Swiss compatible plate is used as a selling point by tripod makers. Not all quick release plates that appear to follow the Arca Swiss design are completely compatible, even though they might look the same, so it’s worth checking. Many tripod makers still use their own quick release plate designs, including Manfrotto. The Manfrotto quick release plate can be fitted quickly via a spring-loaded catch that ‘snaps’ it into place and it’s kept secure by a locking lever. Makers of cheaper tripods often use their own quick release plate designs. However, since almost all tripods accept interchangeable heads, you can mix and match tripod and head brands according to your liking.